Water is refreshing and hydrating…but it’s also sometimes pretty boring. And when you’re switching from being a regular soda consumer, it’s even more boring, making it extremely hard to drink the recommended 8 cups of water per day. 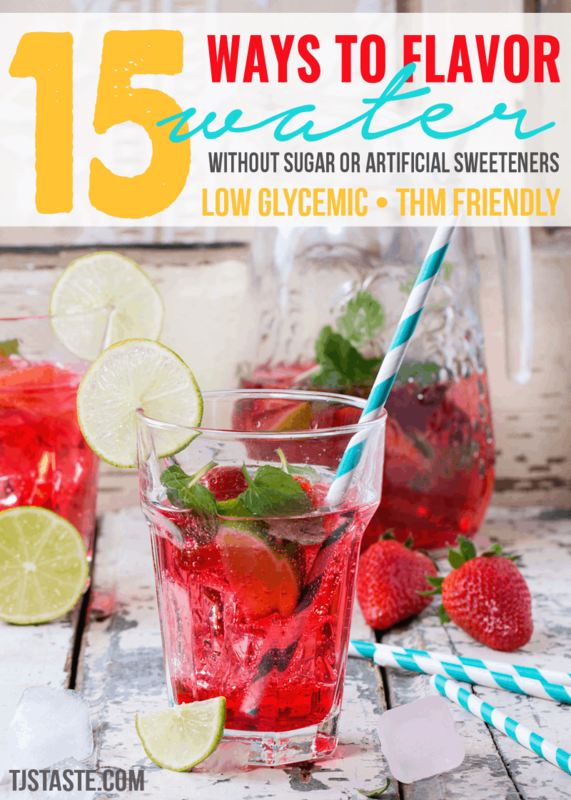 So, here are some helpful ways to flavor water (without sugar or artificial sweeteners) to enhance that water and make it much more palatable! Whole fruit. Lovely, lovely fruit! Add a bit of just about whatever you like. Strawberries, blueberries, raspberries, blackberries, lemons, and limes are great neutral options. Pineapple, grapefruit, pomegranate, oranges, kiwis, and cherries are a few excellent carby options. Add to a glass or pitcher of water, crush, and allow to infuse the water for 4 or more hours. Veggies. Cucumbers, tomatoes (yeah, technically a fruit), and fresh ginger root are just a couple of yummy water flavoring veggies. Add slices to water, chill, and allow to infuse for at least 4 hours. 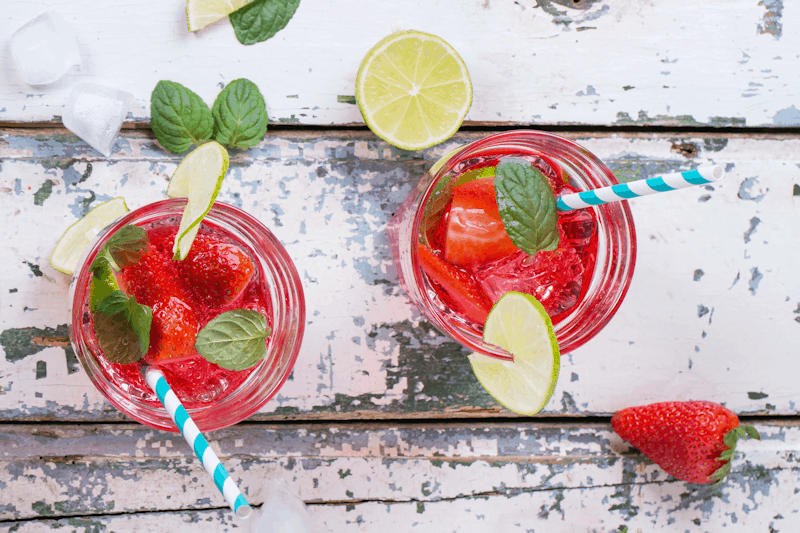 Mix and match with fruit or other ingredients for double the flavor (strawberry-cucumber water, please!). Herbs and spices. Mint leaves, parsley, cinnamon sticks, nutmeg, lavender, whole cloves, and cayenne pepper are a few ideas. Chop up leaves, crush the nutmeg or cloves a bit, add lavender or cinnamon sticks whole, or mix any powdered spices into the water. Chill and allow to infuse for 4 or more hours. Tea. Add a bag or two of tea to hot water and allow it to steep for 20 minutes or so. Chill if you prefer iced tea. Add a few drops of liquid stevia to sweeten it up if you like. Essential oils. I’m not the biggest fan of unnecessarily using essential oils internally, but if you’re okay with it, it is a great, neutral option as well. Add a few drops of any of Young Living’s Vitality essential oils to your water. Shake or stir often as the oils tend to rise to the surface. Also be sure to use a glass drinking container as many essential oils will dissolve plastic or cause toxins from plastic to leach into the water. True Citrus. True Citrus are little packets of citrus flavored yumminess. The low glycemic varieties are True Lemon, True Lime, True Orange, True Lemonade, True Raspberry Lemonade, True Lemon Iced Tea, True Black Cherry Limeade, True Mango Orange, True Peach Lemonade, True Lemon and Watermelon Aqua Fresca, True Limeade, True Lemon Strawberry Lemonade, and True Wildberry Lemonade. Please note that some varieties of these do have a wee bit of sugar (so some are technically not sugar free; if it has 3 grams sugar or less, it’s allowed on the THM plan), but it’s so very little that it does not typically bother blood sugar (back off if it does bother your blood sugar or causes weight loss stalls). Powdered water enhancers. My favorite powdered water enhancer is made by the Everly brand (and my favorite flavor is pomegranate). You can buy Everly in handy, transportable packets or in a large bulk pouch. Another good brand is Ultima Replenisher. Liquid water enhancers. Some excellent low glycemic, Trim Healthy Mama friendly liquid water enhancers include Stur (but not the powdered kind, too much sugar) and SweetLeaf Water Drops. Be sure to check the ingredients just in case certain varieties have sugar or artificial sweeteners. Juice. If you can find some just plain juice (not concentrate, no sugar, no artificial sweeteners), you can a add splash or two to flavor water. R.W. Knudsen has some pretty good no sugar or sweetener added juices (read ingredients to be sure and be conscious that most of them will contain carby fruit). You could also make your own juice with a juicer. Apple cider vinegar. This adds acidity just like citrus juice or fruit might, so be sure to drink it carefully and with a straw. It adds flavor, boosts immunity, but can also hurt your teeth if overdone! Be sure to use raw apple cider vinegar (the kind with the mother) for maximum health benefits. Sweetener. Stir in some powdered or liquid stevia or other low glycemic sweetener to simply sweeten the water. Mineral salt. Salt can enhance the sweetness of your sweetened water, boost the body’s absorption of the water (as long as you don’t turn it into sea water), and transforms the water into an electrolyte drink. Add roughly 1/8 teaspoon (a pinch) per 8 ounces water. Bubbles. This technically isn’t a way to flavor water, but it does mentally make it feel like soda. Use plain, store bought seltzer water or, if you have a carbonating machine like the Soda Stream, add your own carbonation. Rose water. Get fancy by adding rose water to taste. Broth or stock. Make some homemade beef or chicken stock or broth and just drink that up or dilute it a bit with water. Sure, this isn’t a sweet option, but it’s still pretty yummy! Infusion pitcher. An infusion pitcher makes things a tidbit easier. Infusion glass. An infusion glass does well for a single serving. Cherry pitter. Pit cherries fast and easy. Strawberry huller. To remove the greens from strawberries easily (although you can eat them, they’re good for you too). Herb scissors. Herb scissors make chopping up mint and other leaves fast and easy. Orange peeler. To peel oranges faster. Apple corer. For coring apples, duh. Mason jars. My favorite are the spacious 24 ounce size. I have doing a lot of research on this topic and so far this website has been the most useful. Thank you so much!